Throughout history, humans have arranged themselves into societies based around hierarchy and a system of selecting who is allowed to wield power—these social constructs are called governments. At its best, a government exists to provide the common defense, preserve the rule of law, promote the social welfare, and do the things which private industry cannot do equitably or efficiently (ex. maintaining the roads). At its worst, a government can kill millions, promote exploitation, repress its population, and syphon resources from the citizens to the elite. The United States was originally designed to be a form of representative democracy called a constitutional republic. In this form of government, citizens elect politicians to represent their interests, both on the state and federal levels—these politicians are directly accountable to their constituents. Unfortunately, as money has crept into politics and promoted an ever increasing centralization of power into the hands of a small group of elites, the United States has started to look less like a constitutional republic and more like a kleptocracy. 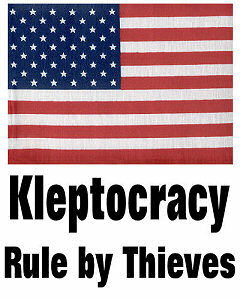 A Kleptocracy is a type of government where those in power have turned their authority towards the goal of syphoning wealth from the general public and giving it to the elite; the elite who benefit in a kleptocracy include those in government as well as those with significant power in the private sector. Through utilizing public funds, tax revenue, and government force for personal gain, the elite in a kleptocracy are able to accrue huge amounts of wealth and perpetuate their own political power. In a kleptocracy, the elite in society create a vicious cycle of wealth accrual and political power. During the creation of a kleptocracy, the elite use their wealth and influence to capture the government and gain the ability to manipulate policy. Once the elite capture the government, they change policy to benefit themselves and begin to utilize public money to increase their personal profits. As their personal fortunes grow, the elite kleptocrats complete the cycle by using a portion of the money gained from controlling the government to perpetuate their political power. Once this cycle is initiated, it is very difficult to stop and usually results in widespread income inequality within a country. Tax rates on wealthy Americans and corporations are at a record low and it appears virtually impossible that this will change significantly in the near future. This decrease in tax income taken from the rich is economically unjustifiable, yet has been pushed by many wealthy individuals, as well as the politicians who are bought by them. Corporate accountability has been drastically reduced in the United States; this reduction benefits American elites because it allows their corporate interests to produce more profit for them, without having to worry about ethics or the danger of being sued. The perfect example of this destruction of corporate accountability is the lack of charges and consequences on the banks after the 2008 economic crash. Despite the presence of a great deal of evidence proving the fraud perpetrated by the banks in the lead-up to the 2008 crash, no bankers have been prosecuted and no banks have been broken up. Government contract are given to corporations which have economic connections to political elites. In the last decade, American elites have directed ever more government contracts to corporations which they control, or which give them money. There are innumerable examples of this cronyism, but the largest example is that of Cheney and Halliburton. While Cheney—the ex-CEO and current stockholder of Halliburton—was vice president, Halliburton received billions in government contracts and preferential treatment in environmental regulations. Public policy in the United States has been co-opted and redirected to increase the wealth of a small minority of elites. The good of society has taken a backseat to interests of the elite and the United States is suffering for it. When the political and economic elite of a society corrupt policy to the degree which we have seen in recent years, the corrupted government ceases to be a populist government and becomes a kleptocracy. In order for the elite in a kleptocracy to sustain their policy agendas and control over the government, they must keep political and economic power centralized within a small group of people. In most cases, kleptocrats will gain control over a government by either becoming the political power structure (ex. become a dictator) or utilizing their resources to gain control over a political party (ex. buying numerous politicians). The control over government held by elites in a kleptocracy allows them to manipulate public policy and sustain their political power. In the United States, the rise of the super-PAC and demise of campaign finance laws are the two situations which have driven our democracy towards kleptocracy; we still have the illusion of democracy, but any choice which we are given is likely to either be bought by the elites, or unlikely to be elected because of massive opposition by moneyed interests. Elites and corporate organizations exert political power through giving money (Read: bribes) to politicians as well as through running political ads to influence voters. During election seasons, moneyed interests pour huge amounts of money into running deceptive ads. Deceptive advertisements trick people into voting against their own interest and into voting for the interests of those in power. Given the abysmally low level of knowledge that the general public has surrounding public policy and civics, it is very easy for deceptive ads to sway marginal (independent) voters away from non-bought politicians. Once in office, American politicians are faced with the choice to vote their conscience, doing what is best for their constituents, and the choice to enrich themselves by doing the bidding of the elite. Unfortunately, this lure of money is most often too strong for people to resist, and most politicians are bought by somebody. Once bought, these politicians no longer work for the people, but rather become the employees of moneyed elites. With the elimination of campaign finance regulations allowing a tsunami of secret money to flood the political scene, American politics have become terrible corrupt. Money may not buy everything, but, if you have enough, it can buy a government. If the kleptocrats behind the politicians are the true power, election result don’t matter—any corrupt politician voted out of office will simply be replaced by the next puppet of the kleptocratic elite. In a kleptocracy, the goal of government is not to help the population or sustain a functioning society, but rather to keep feeding the elites in control of society. To a kleptocrat, any program which does not benefit them is waste and must be cut, regardless of its benefit to society. Any money “wasted” on the non-elites of society is money which the kleptocrats could be putting into their pockets. Over the past several years, mainstream American politics has been focused upon cutting the deficit and dealing with the national debt. Political elites (and corporate interests) have convinced large portions of the population that cutting from social programs and entitlements is necessary in order to protect the country from a debt crisis. At the same time that these elites are proposing draconian cuts to programs which benefit the average American, they protect programs which give money to corporations and refuse to consider any possible tax increases on the wealthy; corporate subsidies, military contracts, and tax cuts on the wealthy bear the lion’s share of the blame for the current budget problems of the United States, yet political elites are focused upon cutting the small and effective social programs which support average Americans. Put plainly, these political elites are not looking out for the best interest of the country and are simply helping (or part of) the kleptocratic class which has captured the American government. If American political elites truly wished to deal with the deficit, they wouldn’t be protecting the multi-trillion dollar Bush tax cuts—tax cuts with no actual value to society—while proposing cutting millions of dollars from the school lunch program. The only possible justifications for such budget choices are either absolute ignorance of economics or a desire to protect the elites at the detriment of everybody else. Any programs not benefiting the American elite are being cut, just so that the elites are not forced to support anybody else in society and to free up even more money to give to them through tax cuts (ex. the Ryan Budget). Characteristic #4: Dissent from the status-quo is squashed by institutions of the state. Since a kleptocracy’s goal is to pander to the interests of an elite few, any dissent by the public is automatically portrayed as extreme, delegitimized and suppressed. Kleptocrats don’t care about the opinions of their citizens, nor do they wish for people to get organized in order to protect their interests. Any such dissent has the potential to disrupt the status quo, thus reducing personal profits by the kleptocrat or even resulting in an overthrow of the kleptocracy. In order to suppress uprising, kleptocrats will often utilize a combination of media control and police force in order to disrupt protesters and prevent the average citizens from becoming mobilized. The reaction to the “Occupy” movement by American police forces and federal agencies has illustrated just how a kleptocracy will deal with protests against the status quo. Regardless of ones’ opinions on protest movements—like the Occupy Movement—it is absolutely inarguable that they have the right to assemble and protest in the United States. Regardless of the constitutional protections on their ability to protest, the Occupy movement spreads a message which is very inconvenient to kleptocratic elites, thus elites dedicated a significant amount of effort into attacking the Occupiers. At the outset of the Occupy Movement, the mainstream media either refused to cover the protests or covered them in a dismissive manner. 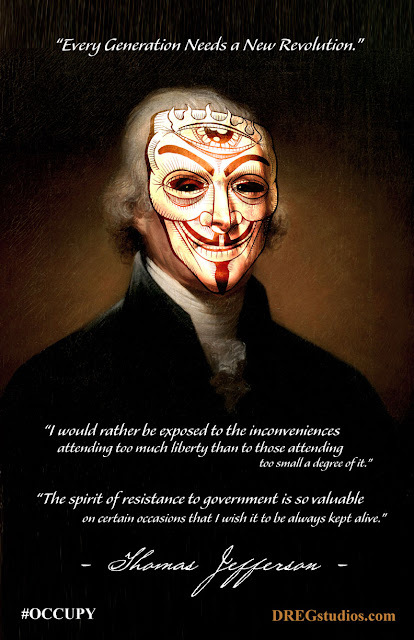 Common memes that were used to attack the Occupiers included calling them “dirty hippies”, “bums”, “unfocused”, or disorganized and not having a coherent message. Media corporations are often controlled by the very elites who control politics, so it is well within these elites’ power to affect media coverage. In concert with the media blackout on the Occupy Movement, police and federal law enforcement agencies were tasked with suppressing the occupations. The Occupiers faced numerous mass-arrests and police harassment in cities across the country; these arrests were coordinated across cities by federal agencies, despite the fact that there was no justification for such federal involvement. In modern America, protests which challenge the status quo are constantly harried by federal and state interference. In essence, protest is allowed only if it supports or does not threaten the interests of those in power (ex. abortion protests are okay because they don’t attack the moneyed elite). In the new American kleptocracy, elites are given every economic advantage and have near-absolute control over policy. Public policy is becoming increasingly tailored to the benefit of the elite kleptocrats, and the rest of society is left to suffer the consequences of neglect. Unless we do something to change the current path of our country, we are facing a situation where our country will become little more than a field for the wealthy to harvest and our citizens little more than serfs, indentured to those with all of the power in society.